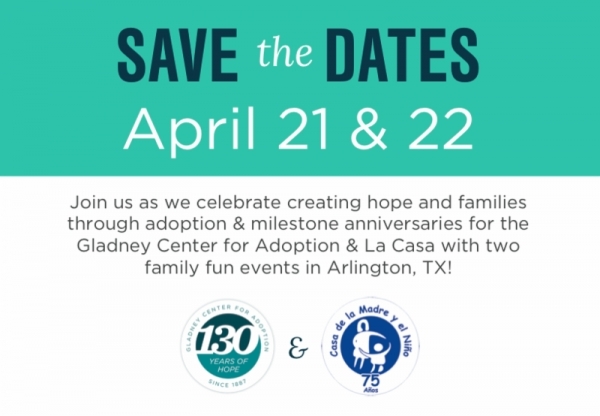 To celebrate La Casa’s 75th Anniversary and the 130th Anniversary of “Gladney” the International Adoption Agency, we will get together in Arlington, Texas, the 21st and 22nd of April. April 21st, the families will gather together at Six Flags Atlantis Amusement Park from 5:00 pm to 10:00 pm. April 22nd we will have an exclusive encounter with families and friends of La Casa, from 11:00 am and 2:00 pm at River Legacy Park. This is a great opportunity to meet the persons involved in our community and also to enjoy the games and raffles.